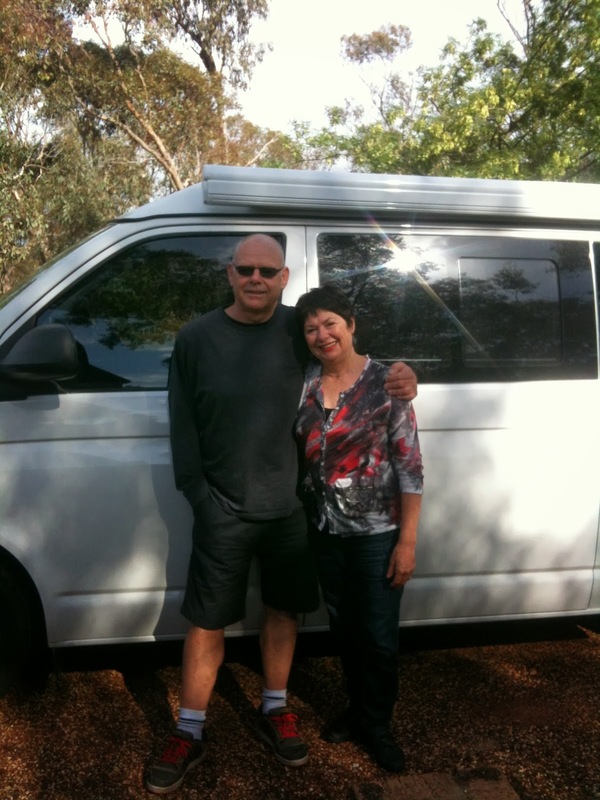 This is part of a blog book launch tour for author Kevin Burgemeestre. I met Kevin recently at a book gig at Bendigo. He has a wicked sense of humour. Over to you Kevin. Here are a few questions I'm sure you'd like to answer. Hi Lorraine. Nice to see you again. Thanks for the invitation to visit. Q. What advice would you have for anyone wanting to write a book in your genre? A. Get to know your teenage self and don’t be afraid to display some mawkish and embarrassing moment, because events like that ring true with all of us. I’m fond of teenagers because they don’t have as much hard skin to protect them. And because they’re rookies, they make awesome rookie mistakes. Don’t try to solve every problem. My wife Lee is allergic to stories that end with truckloads of money suddenly appearing, or a castle, or magic powers. Lastly, unless you are the bestest word wizard ever, don’t be afraid of a rewrite. Or another rewrite. Or to write things differently. Q. Other than writing, what else do you love? A. I love riding my bike a little faster than it’s wise to do. (Don’t tell mum) I love going to galleries and films with my girl. OMG, I’m totally mad about being near the water, travel, riding horses, fast cars, going in planes, getting a present just right for someone you love, music that gets you right in the chest, laughing with friends till my stomach hurts. Is that a fair start? Oh, and bears are cool. Q. What were you in a past work life (if anything) before you became a writer? A. I was this weird illustrator-thingo. They are very strange folk. Incredibly self-obsessed. Q. Describe your perfect day. A. Just the one? Man, so unfair! In our busy lives, time to spend with friends and family and not feel guilty about having to be somewhere else; a great walk or swim; nice food that’s not crazy pretentious; lovely conversation on a deck looking out to sea with the sun going down. And while that’s happening getting a really great idea for a book! Q. What five words best sum you up? A.Fun, sympathetic, kind, sharing, mischievous. Thanks for the interview Kevin and all the best with your book. Be sure to enter the competition. Details below. 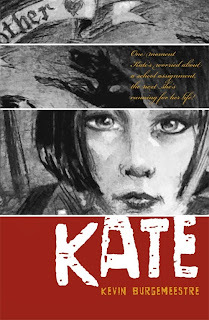 As part of the blog tour, we will give away a copy of Kate. To be in the draw, simply comment on the post and send an email of your comment to submissions@morrispublishingaustralia.com with the subject "Kate competition". 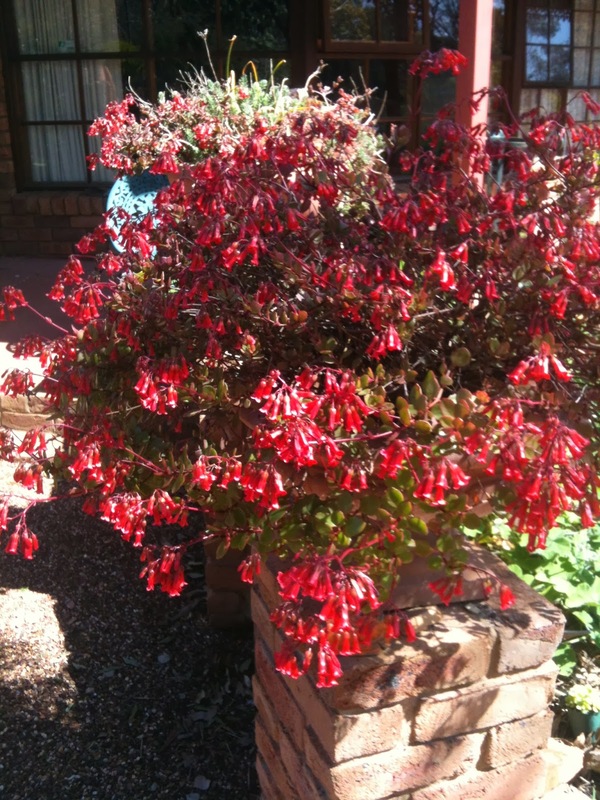 You might like to look at other blog posts . Wow I can't believe that I'm blogging over here. It is making me think of different ways of engaging with an unknown audience and also thinking a bit about my writing journey. I have conducted many poetry workshops lately and I'm constantly reminded that many children need this mantra to be foremost- poetry doesn't have to rhyme. Also poetry doesn't have to have big picture content or be about life, death and love but about the tiny moments that kaleidoscope a day. To me this is true poetry. 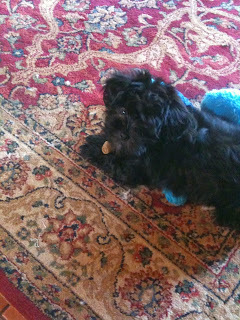 Here is my latest inspiration and distraction. Welcome Monti. October and I'm working on a new book. I love getting into the rhythm of regular everyday writing and when I do I wonder why I haven't disciplined myself enough before now to make it an unyielding habit. This week I am workshopping into Melbourne schools, both primary and secondary, so no writing then, but showing the love of writing poetry. Two of my techniques that I've pioneered- incident writing and images will be demonstrated again. Such satisfying and fully attainable poetry techniques, always bringing new poems into existence. 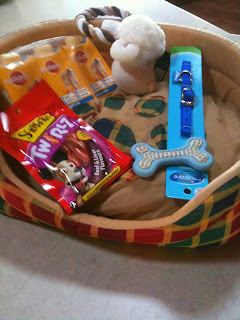 I am continuing my blogging over at Christchurch kids blog. 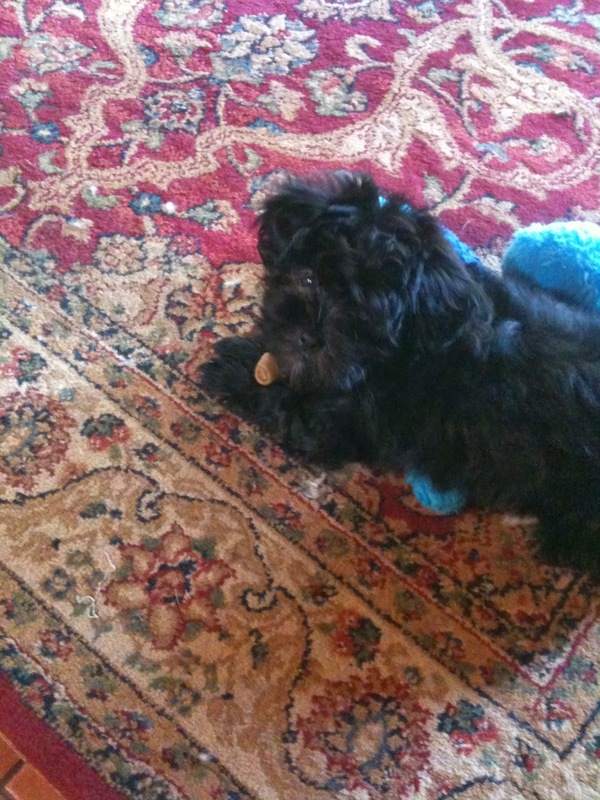 We also will welcome a new puppy into the family. I haven't looked after a pet for years, so this is both exciting and challenging. Here is his welcome pack so far. My writing friend Janeen Brian and her husband Jon visited so of course we talked and talked and talked. Ohh, where did September go? I've been out into the Wimmera/ Mallee teaching poetry for a week and writing new poems. To be ready to teach from Prep to year 12 took several weeks to prepare new techniques and organise. But it is always a privilege to help children to write! And now I have written new techniques to use in other teaching settings as well. 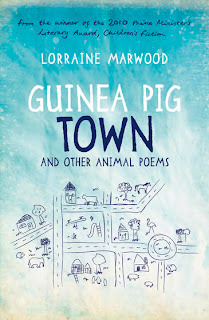 Walker books has a blog post about 'Guinea Pig Town and other animal poems' here. Meanwhile I am writing for a new collection of poems- more about that later. I can't believe that I haven't posted for awhile. 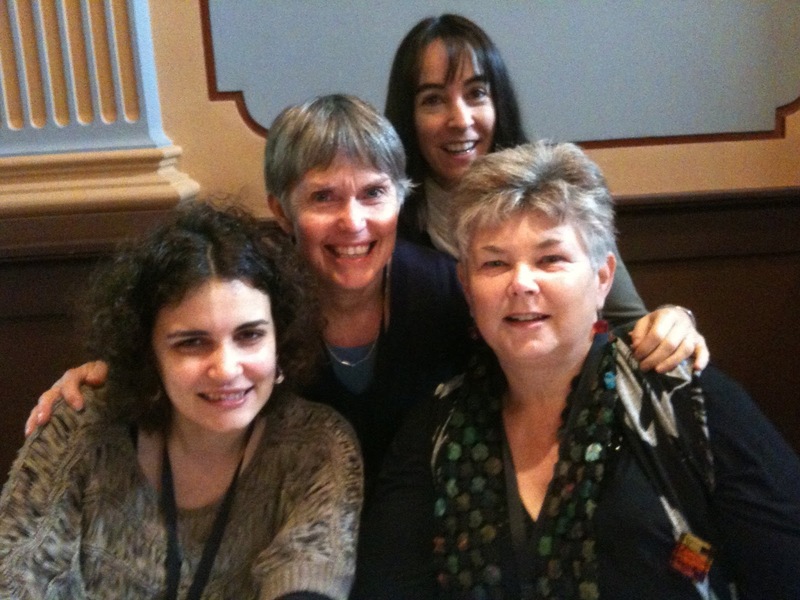 I've been involved in The Bendigo Writers' Festival and lots of projects that need re-writing, discipline, perseverance and TIME!!! Here I am with Ambelin Kwaymullina, Dianne Wolfer and Pam Harvey and yours truly! What a great company of children's authors. A festival like this re-energises my craft and determination and re-kindles my love all over again for writing and reading. 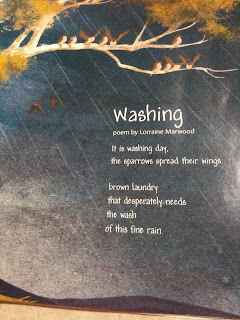 And here's a poem re-printed in the latest edition of 'School Magazine' New South Wales- nearly ten years ago it was one of my first poems published in the magazine. Love the opportunities for poetry for children! 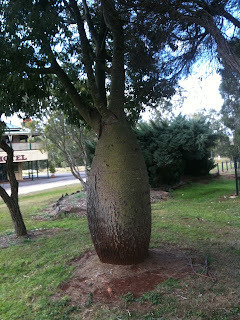 I particularly loved seeing specimens of the bottle tree- how amazing! As well as a chance to indulge in a passion I've never lost - looking for little beach treasures and lately sea glass is top of the list. A few lines written in my note book, various short poems all written for a collaboration project with my daughter Tamara for the Bendigo Writers' festival coming up soon, were the main pieces written. A meeting with my editor and publisher has given me more direction also in the re-writing of two manuscripts. Now to re-establish writing routines. How do you manage to make writing, creating a priority in your life? Two weeks' residency coming to a close- one session left to take- Atmosphere in poetry. It's been amazing encouraging already creative boys to try one word, one line poems, images, texture, symbols of Australia, Explore... 14 techniques across the year levels, all that I've written. I love to be also challenged to learn new words, ways of looking at things and be challenged in my own writing of poetry. And tried out some challenging techniques for year 6- Atmosphere. Thanks to Li in the library and the wonderful supportive staff at Sydney Boys' Grammar, Edgecliff. Well yes I've been writing, but in a different direction-writing poetry strategies to encourage others to write also. In the process, I write an example poem then construct scaffolding for others to 'take the plunge' into the fascination and satisfying realm of writing. Here's a sample from my texture poem. when owls hunt at night"
And of course another wonderful photo of animals (and Quinn) at my recent book launch. 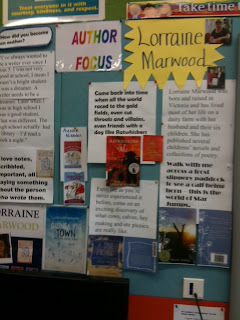 Any way I spent the day at Holy Rosary school with the lovely librarian Eva, who plans to teach poetry to the classes. 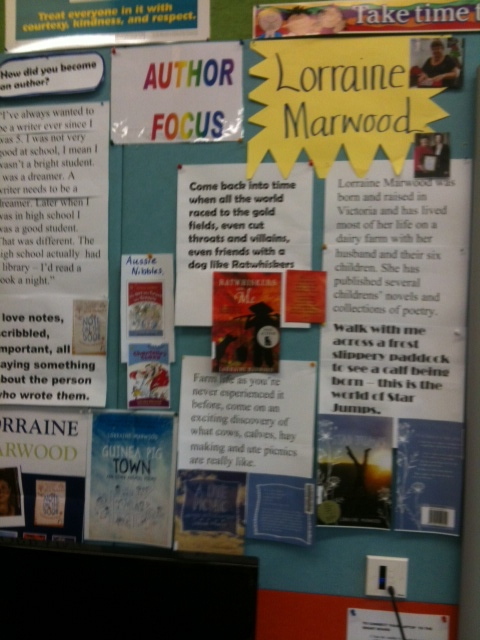 Here is a snapshot of the information board she prepared prior to my visit. It makes me realise that I need to update information on my website too! If you are after a way to write a new poem here's a website I was on during poetry month. Thanks for hosting Laura Salas. 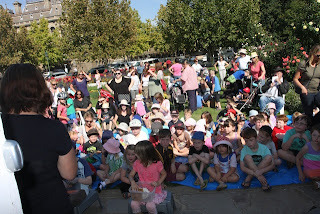 Yah on Wednesday my new book ' Guinea Pig town and other poems about animals' had a book launch in Bendigo at the conservatory gardens and in conjunction with the Bendigo library. Thank you Tammy. 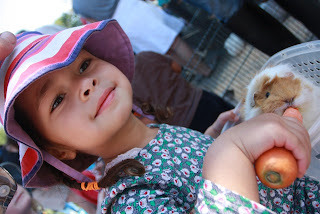 We had an animal farm and guinea pigs to hold. Then we headed to Woodend for a second launch- what a fabulous day! But I think every author needs a trick horse- here is Eskimo and he stole the show. Thanks to all my family, supporters and kids for coming! And look what arrived in the mail today today- from my family in UK to celebrate all things to do with Guinea pigs and poetry. What poem wil you read on World poetry day or maybe you might write one! It's actually a rather gruesome cover, but Oscar is a harmless little dog wanting to discover an Oscar party all his own. This idea germinated in a park in Western Australia from a comment a lady with a dog made. I tried many versions, mainly picture book text until Oscar evolved into the story of an dog who lived with old Jim at the local rubbish tip. Some stories can years to shape. As well as writing, I've enjoyed two forms of craft. I've wanted to knit some dish cloths pattern here. And these are what I've made so far from thrifted cotton. Then there is my need to do beading. I've finally figured out how to make necklaces. I do love crafting and writing- similar in some ways, immensely satisfying. last Wednesday- take a peek to see what great books are coming out this year from Janeen. A joint idea from my publisher and myself. 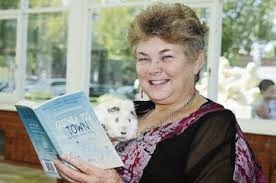 Sarah Foster is very keen on poetry and a book about animal poetry flows on from my other two collections with Walker books- ‘Note on the door and other poems about family’, A Ute picnic and other Australian poems. 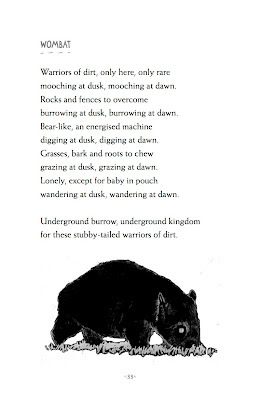 Children’s poetry, a very lonely genre, but an exciting genre. What actors would you choose to play the parts of your characters in a movie rendition? 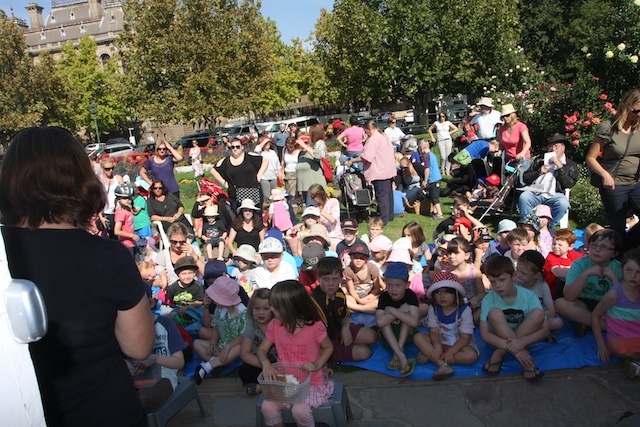 All that is unique, characteristic and playful about animals, both domestic, wild and Australian come together to celebrate poetry for children. 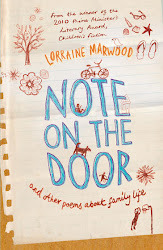 My book will be published by Walker books Australia. I don’t have an agent. Over a year of writing new poems, researching, finding the right tone for the animal and arriving at a title poem to centre the collection around. Some poems were even written in the UK- for example ‘Flamingos’ was written after visiting a restaurant with roof top gardens in London. ‘Narwhal’ was written after visiting Blair Castle in Scotland. ‘Working Sheep dog’ gained its inspiration from Country Clare Ireland and of course my own Australian landscape and farming background. Many more poems were written than actually made it into the collection. Then came revisions, changes, editing. Over 80 poems are in this collection, including two longer prose poems. That’s a hard question to answer as very few poetry collections are published in Australia. 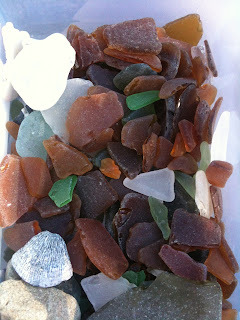 I think it compares to my two previous collections with Walker around a central them of Family and Australia. I love poetry, its brevity yet rich vision. Sarah Foster and the landscape and world around me inspired this collection - much to celebrate and enjoy. And the shape of a collection comes together over time and is a challenge to incorporate variety, mystery, drama and emotion. What else might pique a reader’s interest? I think the variety in format and style, even to some rhyming poetry. a reader can dip and savour throughout the book. Wild Thing Lane, Precious Pet Parade, Seascape Drive, Creepy Crawly Crescent – to name a few. The poems themselves are often little moments in time, in observation, presented in sensory detail and lend themselves to a pattern for writing by the reader. My aim is to allow the reader to look at the world from a new perspective and marvel and enjoy. Next Wednesday 27th of February Claire Saxby will be in the next instalment of this blog tour. My new book is currently at the printers! Exciting. This book has taken over a year to write, rewrite and edit. Mary, my editor at Walker is fantastic with feedback and suggestions. No mean feat tackling the editing of poetry. 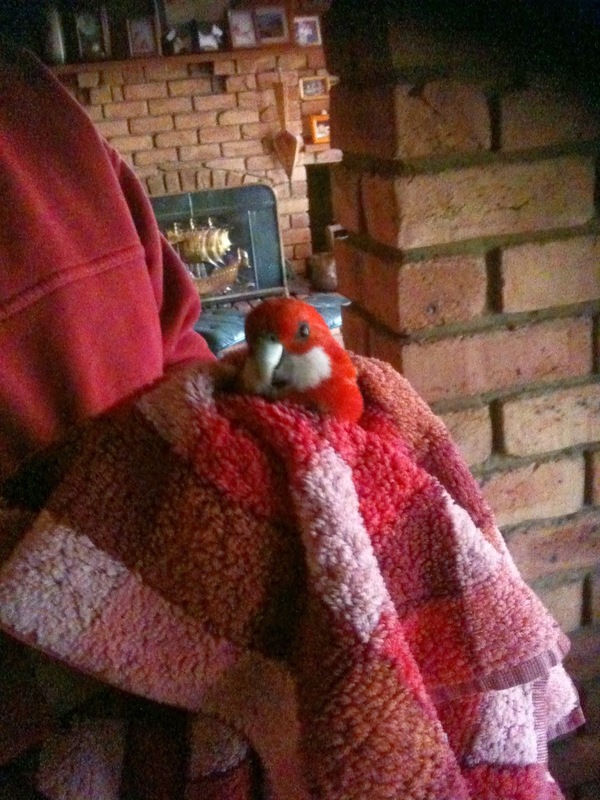 It's all about animals, domestic, wild, Australian, farm. 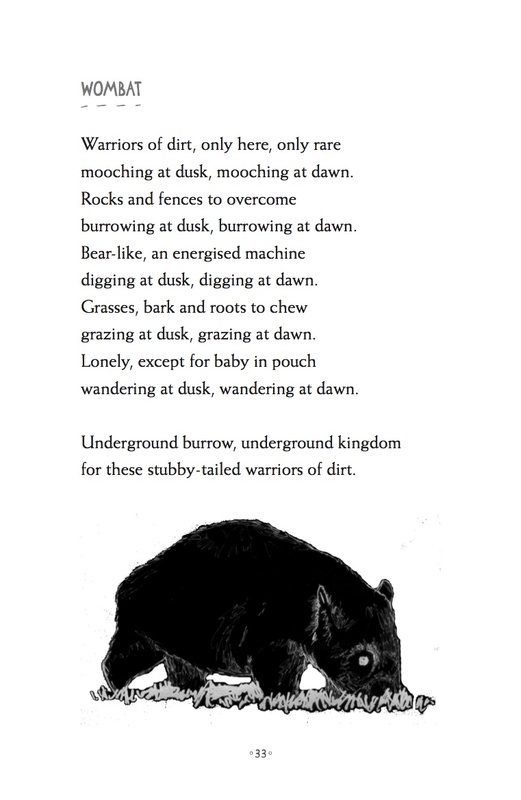 I now research for information about that animal, then find a tone, a dramatic entry, a patterning to write the poem. The whole collection is centred around a prose poem called 'Guinea Pig town '. Some poems were written while overseas like the Flamingo poem, Narwhal gained its inspiration from a castle in Scotland. I think the growth from this collection for my own writing craft, is the research needed to make that small animal poem full of vibrancy and detail. Important poetic considerations from my viewpoint. What's important in poetry to you? A great book has a great title- and what an eye-catcher this one is! It serves as an invitation to join in the conversation, to observe, to revel in the remarkable photographs that accompany the text in this picture book. Succinct words and fabulous animal photographs are the stars of this book. 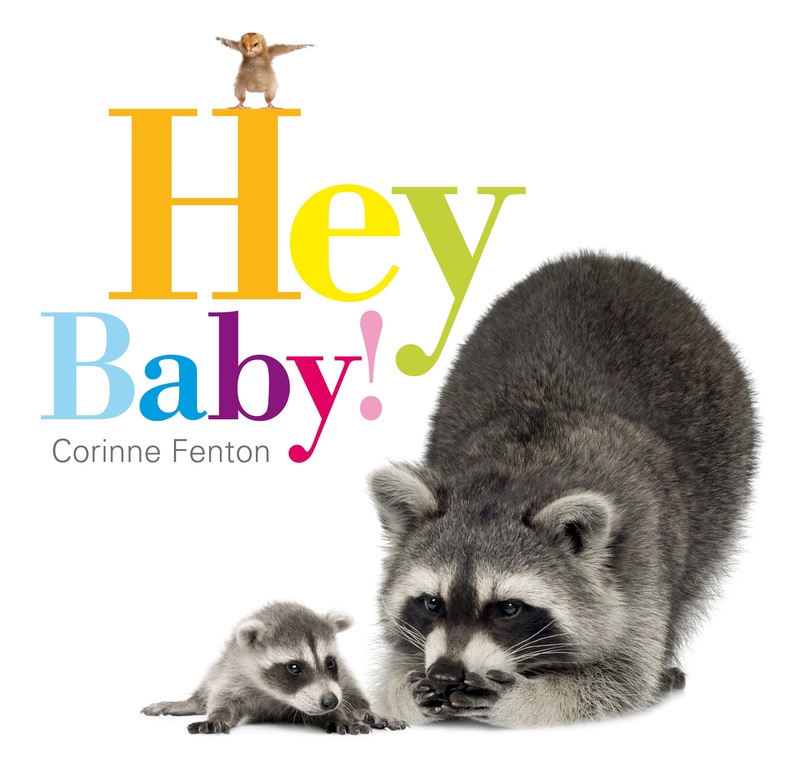 This makes a delicious, caring read to share with a new baby or toddler. What an affirming, positive, liberating experience. Words are highlighted in colour. For example splash is printed in orange to ‘swim’ with the goldfish on the page and this enriches the joy and reading journey of the book. The intimate words and expression of love are underscored with the uniqueness, the preciousness of a baby. And we see that baby right in the end pages of the book. I think my favourite page is the zebra- after seeing one of my grandchildren take her zebra softie to bed with her, I think a zebra shows us our own unique, genetic makeup. Corinne Fenton writes wonderful picture books about childhood like Queenie the elephant and Dog on the tuckerbox. And threads of history begin to weave their way through this new January. I've begun workshops with the Post Office gallery, Bendigo in conjunction with the Art gallery as part of their holiday workshop programs. We're working right beside the 'Growing up in Bendigo' exhibition. What fun. Looking at ordinary people's childhood treasures. I was invited to submit also and eventually chose a beloved craft book given to me by my grandmother in the 1960's. As I revisited it again I realise what a big part creativity has played in my life and continues to play. The workshops involved making /writing memories and then crafting a memory box. I thought that an hour and a half on a 41 C degree day would be too long, but it wasn't if anything we needed more time. Here's a peek at some of the covered boxes.